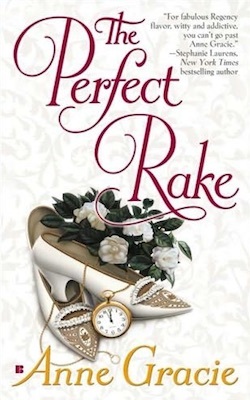 Anne Gracie possesses the rare talent of tugging the heartstrings and tickling the funnybone while creating lovable characters with individual personalities, even for minor characters. (snip) For RRT’s Perfect 10s to have the strongest meaning, we all try to be as stingy as possible with them. 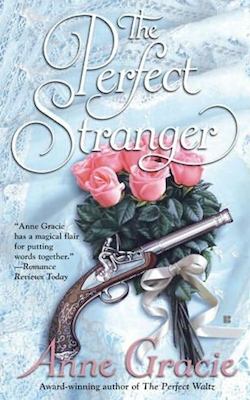 I don’t know how I refrained from giving 10s to the first two of Anne Gracie’s Perfect series, but THE PERFECT STRANGER certainly merits one. It’s rare to find a novel that’s so moving and entertaining at the same time. (snip) I’d give a 10 to the whole series if that were possible. Be sure to add A PERFECT STRANGER to your reading list and, if you haven’t already read them, add the first two books as well. After all, there is no such thing as too much perfection. THE PERFECT STRANGER is one of those books that needs to be read from beginning to end in one sitting. Honestly, I couldn’t put it down. From the very beginning of the story when Faith is being chased and literally lands in Nicholas’s arms, to the ending that makes you believe in the power of true love, THE PERFECT STRANGER is a must read! 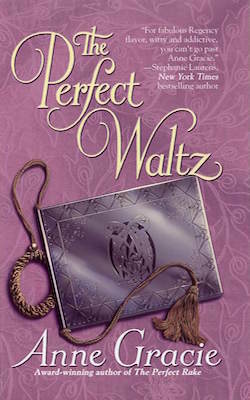 As Faith gives up her dreams of a dashing romance, she finds something even better in the arms of her husband. Their physical relationship is spicy and sensual, and it’s through this vehicle of attraction that Nicholas finds he’s becoming as bound to Faith as she is to him. Lovely. The Perfect Stranger will definitely satisfy readers’ appetites for a poignant, tender romance. If like me, you love Anne Gracie’s stories, you should not miss this book. It definitely goes to my keeper shelf.